RONGTON BUDDHIST CENTRE Inc. - I.B.A. Located in the Tinchuli district of Kathmandu not far from Boudhanath Stupa, I.B.A was created by the Most Venerable Khenpo Appey Rinopche in 2001 and is now headed by Khenpo Ngawang Jorden. The Annual Summer courses at I.B.A. 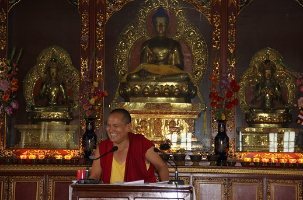 give Westerners and people from all around the world a place to come and study at one of the highest quality Dharma Institutions around today. The students have an opportunity to study and live with highly qualified, and friendly monastics, who are themselves, are learning English and other languages, which makes I.B.A. a very stimulating and dynamic Dharma and social learning environment. I.B.A. through the Chodung Karma Translation Group offer opportunities for those who have an interest in translating previously untranslated Tibetan texts into English. There is also sponsorship needed for the Monastic Leadership Programme with the purpose of serving the wider Dharma communities throughout the world. Of course this requires funds and many of the monastics, and staff work on a shoestring basis. The Health and Wellbeing of the monks is an ongoing challenge in an environment like Nepal, where medical costs are high and not easy to access. For more information follow the link i.e. click on INTERNATIONAL BUDDHIST ACADEMY at the top of this page. 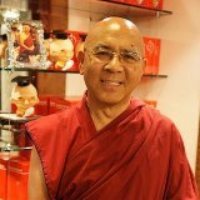 For those who would like to make a donation to support the monk's community at IBA a bank account has been set up by Khenpo Ngawang Jorden in Australia for this purpose.